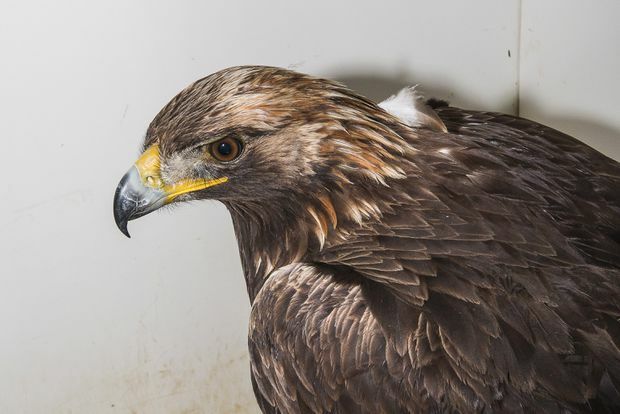 A golden eagle is shown at the Cobequid Wildlife Rehabilitation Centre in Hilden, N.S., in this recent handout photo. A rare bird has ended up in the care of a Nova Scotia rehabilitation centre after being plucked from the Atlantic Ocean by fishermen. The Cobequid Wildlife Rehabilitation Centre usually sees about 30 eagles a year, but last week they got an unexpected visitor — a golden eagle. “It came to us because it was found by some lobster fishermen off the coast of Seal Island about three kilometres into the ocean, which is a very unusual location for a golden eagle to be,” said Murdo Messer, co-founder of the Hilden, N.S., centre. “We figured maybe it went after a fish or got into the water going after some prey and wasn’t able to get back out. According to the Cornell Lab of Ornithology, the golden eagle is one of the largest birds in North America, and is usually found in the western U.S.
Messer said it’s unusual for a golden eagle to be found in this part of Canada. Volunteers did a physical exam on the eagle when it arrived at the centre, but did not find any obvious injuries. “Its body condition was good. Its feather condition was good and it was pretty feisty, and all those things would indicate to us that whatever happened to it was fairly recent,” said Messer. The rehab centre, which has been helping injured wildlife for about 17 years, will spend the next few weeks monitoring the bird to make sure it’s healthy and can fly before being returned to the wild.